The Hyperbolic Time Chamber - Also known as the Room of Spirit and Time, this room is located deep within Kami's Lookout high above the Earth. When in this room time itself is multiplied by 360, and a year inside the chamber will be only a day outside the chamber. Inside the room is also a much denser weather system, and 10x the gravity of Earth. The room is first introduced in the King Piccolo Saga, when Goku is training under Kami. However, in the manga, this never occurs and the room is introduced much later during the preperation for the Cell Games. The purpose of this room is to allow a fighter a much longer time to train then they may have normally. However, you may only enter the room twice in your lifetime and never for for a period longer than 48 hours (2 years on the inside of the room). If these rules are broken the doors will lock and you will be stuck in the room for ever. Goku - To try to avoid confusion this one only occurs in the Anime and not in the manga. During the King Piccolo Saga when Training under Kami, Goku is sent into the room. He could only handle about five months (10 hours outside the room) in the room, because of the extreme heat to extreme cold. After leaving the room he had almost not increase in power, but was probably good experience. Vegeta & Future Trunks - When training for the Androids (And Cell), the Hyperbolic Time Chamber is re-introduced. Vegeta & Trunks, are the first to enter (Excluding Goku many years before) and stay in for about 48 hours. Both fighters power increased enormously and learned to go that beyond a Super Saiyan; Ultra Super Saiyan. This brought their powers from barely being able to defeat Android #18, to easily being able to defeat Imperfect Cell. Goku & Gohan - This took place when training for the Cell Games, Goku and Gohan stayed in the room for about 48 hours, and had an enormous benfit like Vegeta and Future Trunks. Gohan went from not being about to go Super Saiyan, to almost being able to hold Super Saiyan 2. Goku achieved, Super Saiyan 1st Grade, Super Saiyan 2nd Grade, and Super Saiyan Full Power. 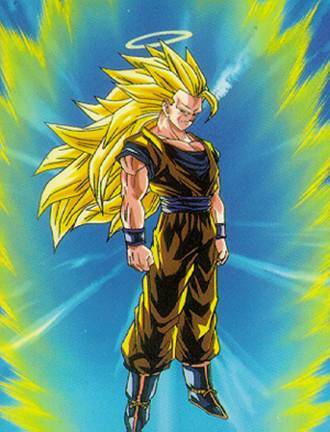 Gohan also achieved Super Saiyan Full Power, but didn't master it aswell as Goku until after leaving the Time Chamber. Piccolo - Also training for the Cell Games, Piccolo wanted to go in alone, as he felt it would benefit him the most without others in the way. When leaving the room, Goku comments on his enormous leap in power, when Vegeta says he's still the weakling he always was. Piccolo ignores this comment from Vegeta, which shows Piccolo not only got stronger, but matured a great deal and was able to reduce he evil side much more. Vegeta - Also training for the Cell Games, Vegeta this time goes in alone. Unlike his previous time, Vegeta have very little benefit when leaving the chamber. This is probably because he knew USSJ, and/or anything like it would prove useless against Cell and he had to figure away to surpass it. Not knowing if that was even possible is probably an explanation for this. Future Trunks - Also training for the Cell Games, When Future Trunks goes he almost has the same results; virtually no power benefit. Goten & Trunks - When Super Buu is finally created, he instantly notices the Z-Warriors power and flies over to it. Piccolo rushes Goten and Trunks into the Time Chamber so they can finish their training. When Buu arrives Piccolo tries to stall him but eventually has to take him to the room. Fortunelty, Piccolo knows the long rout, and leads Super Buu on couple hour tour around the lookout. Eventually Buu gets to impatient and Piccolo is forced to show him the Time Chamber. During the time Goten and Trunks were able to master the Fusion Dance, about 15 attacks, Super Saiyan 1, 2, and 3, and make a plan to defeat Buu. Now here's where things get tricky. Piccolo arrives at the chamber knowing Goten and Trunks were inside, opens the door and walks in with Buu. There are now 4 people in the Time Chamber, and according to Mr. Popo (Who knows more about Kami's Lookout than anyone) this is not possible, thus a huge plot hole is born. After entering Goten and Trunks try to make it look like they don't stand a chance against Buu, but then pull a Super Saiyan 3 on him and win at the last second. Piccolo obviously doesn't know this and thinking they're idiots or just are to weak destroys the exit to the room, thus leaving them trapped in forever. When Buu hears he will never be able to have anymore candy, he lets out such a loud scream, a whole is ripped through space and time letting him out. Now having Candy on his mind, he goes and turns most of the remaining Z-Fighters on the lookout into Chocolate. With Mr. Popo's last action, he saves Dende (who is the current Kami/Guardian of Earth) and allows him to escape. Now what happened to Gotenks and Piccolo? Well, after seeing how Super Buu was able to escape, they tried the same trick. After failing a couple of times, they were finally able to do it and get back to fighting Buu. After that he Time Chamber is never seen or used again. Krillin - He went in the room? huh? Yep, he did, but VERY briefly. When Super Buu was just about to arrive at the Time Chamber, Krillin runs in and tells them to get ready. However, in the anime Piccolo just uses telempathy to let them know.